Abseiling, or Rappelling as it is known in other parts of the world, is your chance to defy gravity! – defined as descending on rope. Ab is down and Seil is rope. The perfect team building event; as you hang suspended from a rope you’ll overcome fears, make a commitment as a united team, and together embark on a challenging but rewarding adventure together. Although you’ll have the full adrenaline rush experience, you’ll be doing so safely. As well as having fun, you’ll also take away several abseiling techniques as our delightful and fully qualified BushSports instructors guide and teach you throughout the day. Abseiling & Rappelling adventures are mostly “straight backward”-no previous experience required! Our helpful and experienced staff will not only stay with you step-by-step but can also prepare you for more on rope adventure activities such as: canyoning, climbing, and caving. Looking for a great Christmas Event? Don’t worry we’ve got it sorted, BOOK NOW! 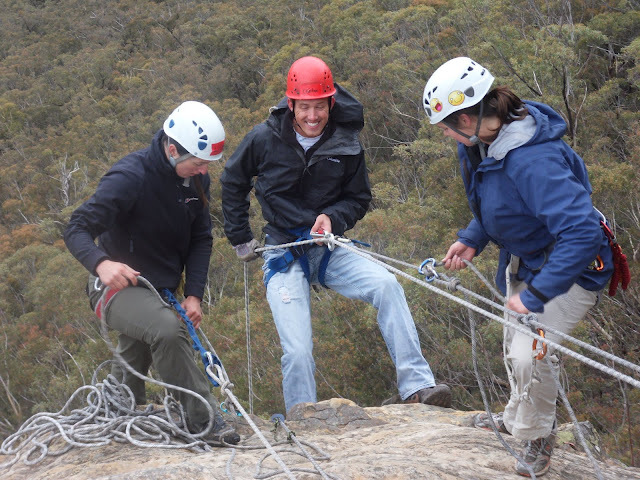 Blue Mountains Abseiling Adventures for Groups and Teams! Merely an hour-1.5 hours away from Sydney, a day of thrilling fun awaits you in the Blue Mountains. You’ll have the opportunity to abseil off spectacular sandstone cliffs, all the while enjoying the splendid scenery that only The Blue Mountains World Heritage Area and National Parks could provide. The highlight of the day is a 60 meter adrenaline charged abseil with 35m (110ft) off the wall free descent! Although you’ll look like a pro, no previous experience is necessary. As seen on Getaway with Australian cricketer Brendan Julian!! 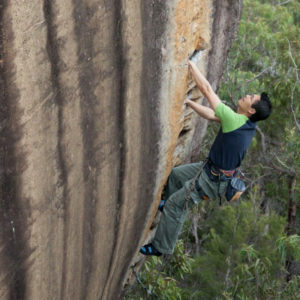 From easy cliffs for beginners to the overhanging thrills of the Katoomba Multi-Pitch. 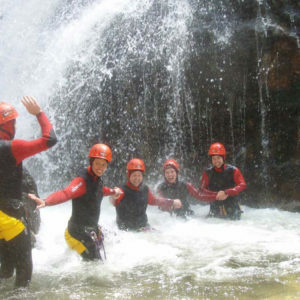 Later on, exrtend your abseil skills to include canyon adventures and waterfall abseil. A half day activity doesn’t mean half the fun! This is the ideal adventurer for beginners or those short of time. This package provides a great introduction to “Learn the Ropes”-Enjoy the thrill by starting on an easy 5m height and comfortably progressing to 30m! Full day abseil experience in the Blue Mountains. 20 storeys of superb overhanging cliff provides an adrenaline shot for beginners and the serious adventure thrill seeker! A thorough morning preparation session will have your abseil techniques refined. enjoy a nutritious lunch then hang on for the 60m abseil plunge off some of the Blue Mountains most inspirational cliffs. A short bush-walk to the top of the rainforest caps off a terrific Blue Mountains adventure day. This is one of the best Blue Mountains sustained abseil adventures: a series of cliff walls near Katoomba in the Blue Mountains overlooks the Three Sisters providing an exciting 240m series of 5 abseils- pitches between 30m and 55m finishing on the Federal Pass Track. At the top of the stunning route, drink in the spectacular views and a refreshing ale! BushSports abseiling guides are qualified, experienced outdoors people committed to ensuring you get the most out of the abseiling adventure. Sharing with you their enthusiasm and knowledge so you have a great day! We also have a host of abseiling courses for the adventurer looking to step it up a notch! An abseil adventure experience you won’t forget! The BushSports action team you don’t have to go far to get it. ‘If city live is driving you out of town, you need an adventure to recharge your batteries! Let our inviting, knowledgeable, and fully qualified adventure staff take you and your team into the thrills of a lifetime as you explore some of the deepest canyons of Australia, experience lush greenery, and feel the cooling sprays of waterfalls as you abseil into places few would dare go. So conquer your fears, seize adventure, and get ready to plunge into an activity like no other! Abseil the Blue Mountains and the majestic beauty of this iconic mountain range is yours. Whether as a team building event or as a solo adventurer, plunging up to 60 meters deep into the lush forest below is sure to give you an experience like never before. Rappel into canyons, next to crisp waterfalls, and into the heart of the majestic mountains. Abseiling in the Blue Mountains is perfect for those of all skill levels, whether the beginner looking to try something new or the abseiler with a bit of experience under his harness. Book today and let us set the perfect adventure for you! Support one another as you conquer your fears as a group. Key ideas for abseiling and rappelling. Abseil, abseil team building, abseil Sydney, abseil blue mountains, corporate team building, outdoor team building, Blue Mountains activities, adventure team building. For your next adventure call Bushsports.